Persistent headache, congestion, red and swollen eyes, postnasal drip, nighttime coughing, inability to sleep, fatigue. But What Started All of This? Your sinuses are the hollow spaces behind and around your nose and eyes and are lined with soft, pink tissue, the mucous membranes. Any number of things can irritate these membranes and trigger inflammation and swelling – allergy, a simple cold, pollutants, cigarette smoke, low humidity, medications - just to name a few. As the membranes swell, they close off the passageways leading to the sinus cavities, interfering with drainage and airflow. Structural nasal abnormalities, such as polyps or deviated septum, may also contribute to the constriction of the passageways. Without normal drainage, the mucus becomes thick and stagnant within the sinuses and can breed bacteria, viruses, and sometimes, even fungal organisms. 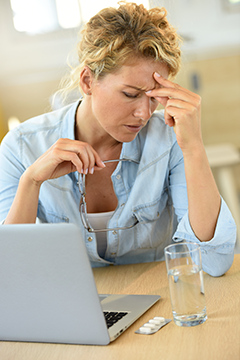 Inflammation increases, pressure builds, and the results are the symptoms of sinusitis. Acute sinusitis usually lasts less than 30 days, and is relieved by supportive and symptomatic care. If an actual infection is involved, antibiotics also may be prescribed. Chronic sinusitis lasts longer than 60-90 days. Medications and antibiotics are often necessary, but may not produce long-term results. Recurrent sinusitis means you suffer multiple sinusitis events in a single year. These recurrent episodes are an indication for aggressive medical, and occasionally, surgical treatment. Possible complications of sinus disease include involvement of the eye and loss of vision, invasion from the sinuses to the tissues around the brain resulting in meningitis, and/or brain abscesses leading to strokes or death. While these complications are rare in this day of good antibiotic therapy, the possibility of these complications should still be understood by patients suffering from sinusitis. In the past, when antibiotics failed, the only treatment option for sinusitis was surgery, typically called FESS (functional endoscopic sinus surgery). This procedure required a hospital stay, general anesthesia, invasive exploration and removal of tissue, and unpleasant nasal packing. Most patients found the recovery period moderately painful and extended, so that they missed a week or more from school or work. Effective sinus treatment today has become more refined and has transitioned from an in-hospital surgery to an in-office procedure. This gives physicians more control, and gives patients better treatment options. A procedure known as balloon sinuplasty (balloon sinus dilation) has enabled physicians to provide alternative treatments that are more accessible, cost-efficient, and satisfactory for most sinus patients. Now, performed conveniently in-office under local anesthesia, balloon sinuplasty affords patients a quicker remedy for sinusitis with more immediate results, long-term relief, brief recovery, and little or no missed time from regular activities. Although patient to patient results may vary, this procedure can be a real solution, not just a treatment. Dallas Eye & Ear has options for you!